write / sew / live - Penny Poppleton - A quick break! I have been swamped - it has been unexpectedly a writerly fortnight for me! (When the muses call, etc.) I apologize for anyone hanging on the edge of their seats for my Quilter's Kit updates. I will reconfigure them to be a monthly feature and hopefully we can get back on track very soon. In the meantime, look out for my tutorials for making half-square triangles (HTSs), making and attaching binding with a sewing machine or by hand, and a few sneaky, exciting things I have been (frantically) working on... watch this space! Oh and I know this is kind of a boring post, I do apologize. I was writing writing writing all last week and the week before - a total of 98,000 words! I finally finished a very difficult scene, and I wrote an entirely new MS. So many characters running around my head! I did squeeze in SOME sewing... look at this beauty. 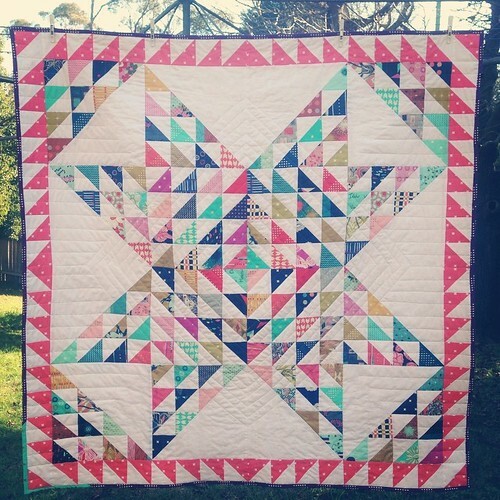 That's the small version of my Shattered Star quilt...stay tuned...more info on that coming along!